KENNEDY SPACE CENTER, FL – For only the second time in history, SpaceX will launch a ‘flight-proven’ Falcon 9 rocket this Friday afternoon and the payload this time for this remarkable and science fictionesque milestone is the first geostationary communications satellite for the nation of Bulgaria. Blastoff of the BulgariaSat-1 communications satellite for commercial broadband provider BulgariaSat is slated for early Friday afternoon, June 23 at 2:10 p.m. EDT, or 18:10 UTC from SpaceX’s seaside Launch Complex 39A on NASA’s Kennedy Space Center in Florida. BulgariaSat is an affiliate of Bulsatcom, Bulgaria’s largest digital television provider. The geostationary comsat will provide direct-to-home television (DTH) and data communications services to Southeastern Europe, including the Balkans and other European regions. The used 229-foot-tall (70-meter) SpaceX Falcon 9 will deliver BulgariaSat-1 to a Geostationary Transfer Orbit (GTO). All systems are GO at this point! And if all goes well there is a definite possibility of a weekend bicoastal launch double header by SpaceX – says SpaceX billionaire founder and CEO Elon. The next Falcon 9 mission is scheduled for blastoff on Sunday, June 25 from Vandenberg Air Force Base in California, barely 48 hours apart. SpaceX is maintaining a blistering launch pace this year. The Falcon 9 booster arrived just hours after launch of the Dragon CRS-11 resupply mission for NASA on June 3 – as I witnessed the recycled rockets arrival at pad 39A first hand later the same day (see photos). 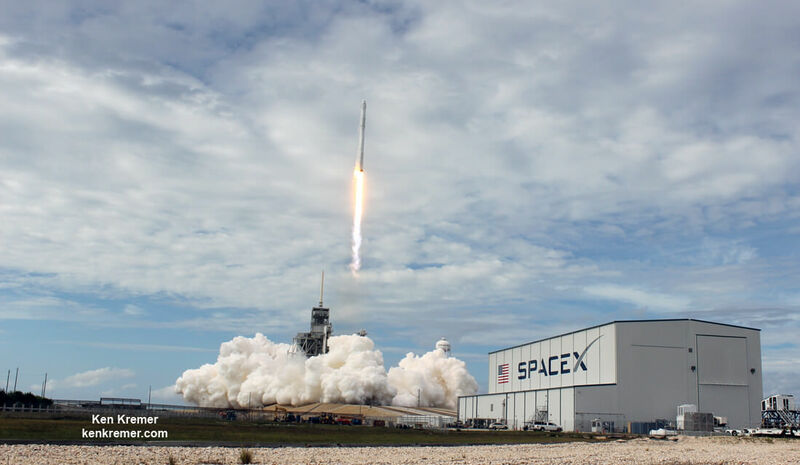 SpaceX successfully launched history’s first ‘flight-proven’ Falcon 9 booster this past March for Luxembourg based telecommunications giant SES on the SES-10 mission – likewise from pad 39A. The late lunchtime liftoff time for BulgariaSat-1 offers a very convenient opportunity for everyone to enjoy an eyewitness view, regardless of whether you live locally or if have the availability to take a quick trip to the Florida Space Coast. And the current weather outlook is excellent say forecasters. The recycled Falcon 9’s launch window extends for a full two hours until 4:10 p.m. EDT, June 23, or 20:10 UTC. Fridays weather forecast is currently 90% GO for favorable conditions at launch time. That’s about as good as it gets for the notoriously fickle central Florida region. The concern is for the Cumulus Cumulus Cloud Rule according to Air Force meteorologists with the 45th Space Wing at Patrick Air Force Base. In case of a scrub for any reason on Friday, June 23, the backup launch opportunity is Saturday, June 24, at 2:10 p.m. EDT, or 18:10 UTC. Likewise it extends for two hours. Saturdays’ weather forecast also quite good, dropping only slightly to 80% GO. The concern is for the Cumulus Cumulus Cloud Rule. Falcon 9’s first stage for the BulgariaSat-1 mission previously supported the Iridium-1 mission from Vandenberg Air Force Base in January of this year. Following stage separation, Falcon 9’s first stage will attempt a landing on the “Of Course I Still Love You” droneship, which will be stationed in the Atlantic Ocean. The satellite was built by SSL in Palo Alto, Calif. It has a design lifetime for a 15-year mission. BulgariaSat-1 will be equipped with 2 Ku-band FSS transponders and 30 Ku-band BSS transponders for fixed satellite services and advanced television services such as high definition television. The historic pad 39A was previously used to launch NASA’s Apollo Saturn Moon rockets and Space Shuttles. The path to launch was cleared following the successful completion of a critical static hot-fire test of the first stage last Thursday, June 15. The hot fire test lasted about seven seconds as I witnessed from Banana River Lagoon and Rt. 1 in Titusville, which provides numerous excellent viewing locations. The BulgariaSat-1 launch had originally been slated for this past Monday, June 19 but was delayed four days to fix a valve in the payload fairing. Watch for Ken’s onsite BulgariaSat-1 mission reports direct from the Kennedy Space Center and Cape Canaveral Air Force Station, Florida.